Chiaroscuro, literally "light-dark", is an art term that refers to strong contrasts between light and dark in paintings or drawings. Our eyes are attracted to the light, to what is easily seen, but our minds are intrigued by the mysterious darkness. And it is the darkness that makes the light shine as it does. Without shadows, there is no contrast. Each item fades into the next, until you can no longer see. Is hell just such a concept? Without hellishness, how can we aspire to heaven? And after all, are people really happy when they experience nothing but happiness? If all of our needs and desires are fulfilled, aren't we left with blandness, saddled with an unbearable lightness of being? 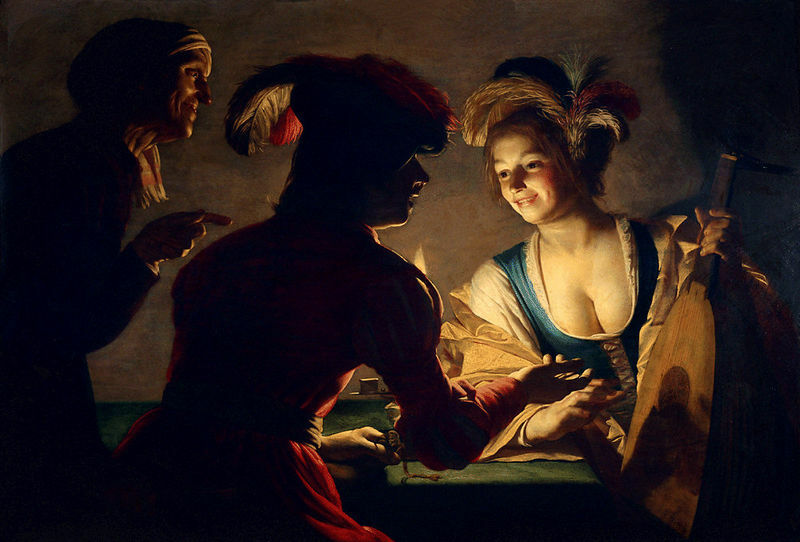 Painters use chiaroscuro to achieve a sense of volume when modeling three-dimensional objects. As writers, we can use that same idea to round out our characters. Put them to the test. Intensify the contrast between the light and the dark. Hold their feet to the fire, metaphorically speaking. See how they react to tragedy, fear, loss. It's worth noting that most belief systems don't send sinners straight to hell upon their death. Rather, the deceased usually face a number of judgments and/or challenges they must triumph over before their final fate is sealed. They might have to climb obsidian mountains, be reborn in a lowly position, or endure pits of fire or ice, but they might still manage to atone and claw their way to heaven. Often, hell is seen as a place of intense shame and regret for one's misdeeds, a staging area for suffering and repentance...but ultimately, for redemption. If that’s not a recipe for a compelling character arc, I don’t know what is. So go ahead: embrace the chiaroscuro, and give those characters hell. I gotta remember to do that -- it's the putting the characters through hell that I'm SO BAD at. Lovely sentiment. I love this. Now I have a great visual to go with the idea of putting my characters through hell. Thanks! i like the hell concept you outline here MUCH better than the usual fare. I wonder what I'm atoning for this week??? My worst ex-boyfriend said "chiaroscuro" so many times, including shooting a moviea bout orange juice called "Chiaroscuro," that he ruined the term for me--but you've redeemed it! THANK YOU! Sophie --you've got lots more hijinks to pursue before you start atoning. LGC and Rachael, glad you like the idea! I think it's because I'm so visually-oriented, but the concept helps me as I write.